He told the Major Economies Forum in London, which brings together 17 of the world's biggest greenhouse gas-emitting countries, there was "no plan B". World delegations meet in Copenhagen in December for talks on a new treaty. The United Nations (UN) summit will aim to establish a deal to replace the 1997 Kyoto treaty as its targets for reducing emissions only apply to a small number of countries and expire in 2012. "In Britain we face the prospect of more frequent droughts and a rising wave of floods," he told delegates. "The extraordinary summer heatwave of 2003 in Europe resulted in over 35,000 extra deaths. "On current trends, such an event could become quite routine in Britain in just a few decades' time. And within the lifetime of our children and grandchildren the intense temperatures of 2003 could become the average temperature experienced throughout much of Europe." The costs of failing to tackle the issue would be greater than the impact of both world wars and the Great Depression combined, the prime minister said. 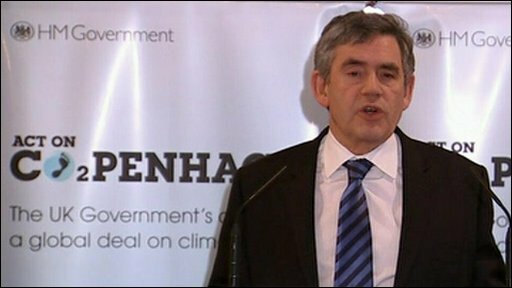 During his term as chancellor, environmental groups often accused Gordon Brown of not paying enough attention to climate change, and the Treasury of blocking "green" policies. He was sometimes compared unfavourably to Tony Blair. However, Mr Brown promoted the inclusion of developing countries in climate finance during the UK's term as G7 president in 2005. And this year, his involvement has become much more overt. He was the first head of government to commit to attending December's UN summit in Copenhagen; and his recent call to establish a $100bn (£61bn) per year fund for climate adaptation is widely seen as giving impetus to those negotiations. Whether current scientific understanding warrants his warning of "catastrophe" for the UK if greenhouse gas levels rise unchecked is perhaps open to question. A recent report by Kofi Annan's Global Humanitarian Forum found the UK was one of 12 nations least likely to be affected by climate impacts. The world would face more conflict fuelled by climate-induced migration if a deal was not agreed, he added. He told the forum, on the second day of talks in the capital, that by 2080 an extra 1.8 billion people - a quarter of the world's current population - could lack sufficient water. Mr Brown said: "If we do not reach a deal at this time, let us be in no doubt: once the damage from unchecked emissions growth is done, no retrospective global agreement, in some future period, can undo that choice. "So we should never allow ourselves to lose sight of the catastrophe we face if present warming trends continue." Agreement at Copenhagen "is possible", he concluded. "But we must frankly face the plain fact that our negotiators are not getting to agreement quickly enough. So I believe that leaders must engage directly to break the impasse." Environmental campaign group Friends of the Earth said Mr Brown had rightly identified the importance of securing a "strong and fair" climate deal. Executive director Andy Atkins said the environmental and economic impacts of failing to tackle global warming would "dwarf anything seen before". He said: "The next few weeks are crucial in determining the long-term future of the planet. The world must pull back from the brink and take urgent action to slash its emissions." In recent days there have been a number of warnings that progress is stalling. Rajendra Pachauri, head of the Intergovernmental Panel on Climate Change, told Newsweek magazine "the prospects that states will actually agree to anything in Copenhagen are starting to look worse and worse". The Major Economies Forum is not part of the formal UN process and so firm commitments are unlikely to come from the meeting. It is seen instead as a gathering where countries can explore options and positions in a less pressured environment.